"I saw an adult Bald Eagle circling the radio towers north of Valley Brook and east of Chubb around 11am from my office." See anything unusual about this photo, taken in Losen Slote Creek Park last week? We saw a dragonfly zipping around, then land, but we couldn't find him. 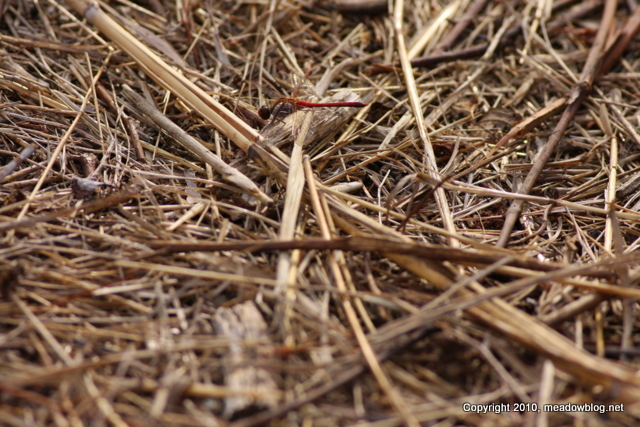 It was like looking for a darning needle in a haystack, so to speak. So we took a photo of where he was supposed to be. Close-up of the shot above follows (it's worth the click). We finally figured out one major reason why we were getting Baltimore Orioles at the birdbath at DeKorte Park's butterfly garden. 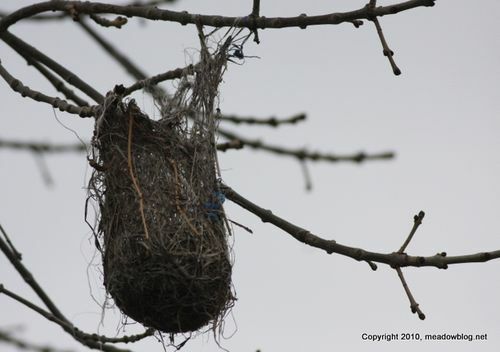 The birds had one of their amazing basket-like nests right next door, on a tree over the roadway maybe 15 yards away. Link to post with shot of Baltimore Oriole at the birdbath is here. 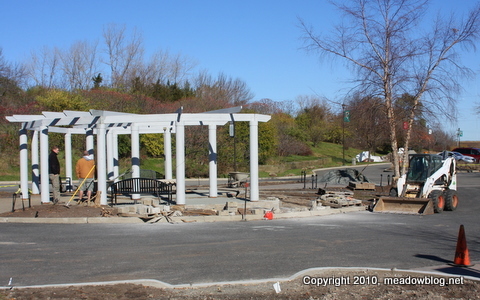 This Sunday is our free monthly "First Sunday" walk, and the site is DeKorte Park. 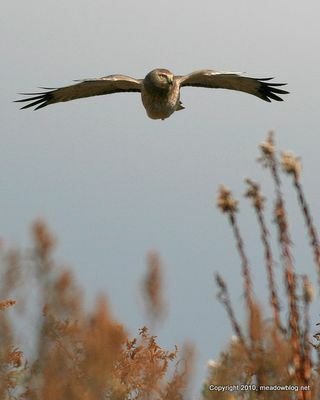 The program begins at 10 a.m.with a short talk, "Winter Raptors of the Meadowlands," by the NJMC's Jim Wright. The talk will be followed by a guided walk in search of winter waterfowl and those raptors. On our last DeKorte walk we had Peregrine Falcon, Redtail, Northern Harrier and Sharpie, and we had American Kestrel on Disposal Road today. At DeKorte are currently seeing plenty of Ruddies, Northern Pintails, Northern Shovelers, Green-winged Teal, Black Ducks, and Bufflehead, and the Canvasbacks should be back soon. The walk is sponsored by the New Jersey Meadowlands Commission and Bergen County Audubon Society. NJMC Naturalist Mike Newhouse and his group of volunteer bird-banders have finished their work for the fall season, weighing and measuring a total of 3,169 birds and 77 species. The most frequently banded bird? The Song Sparrow, at 484. In second was the Yellow-rumped Warbler. 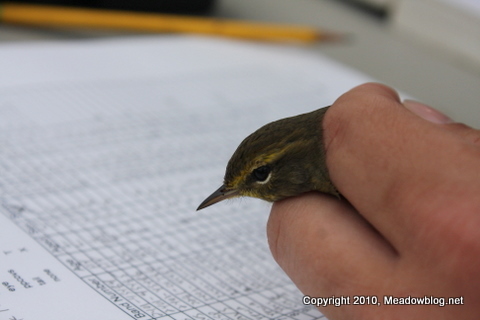 The South Bergenite has a column on the bird banding by the NJMC's Jim Wright. We will post on Thursday. For Fall 2009 totals, click here. For Fall 2008 totals, click here. 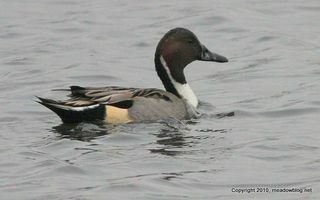 Full list of banded birds for Fall 2009 follows. Don't be shocked the next time you see the Butterfly Garden at DeKorte — it's getting a major facelift and some new plantings, in plenty of time for next spring. 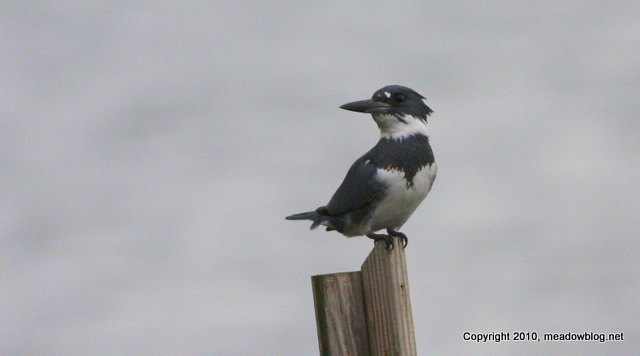 Finally photographed the male Belted Kingfisher who has been zipping around the Shorebird Pool. The white spot in front of the eye is really distinctive on this bird. 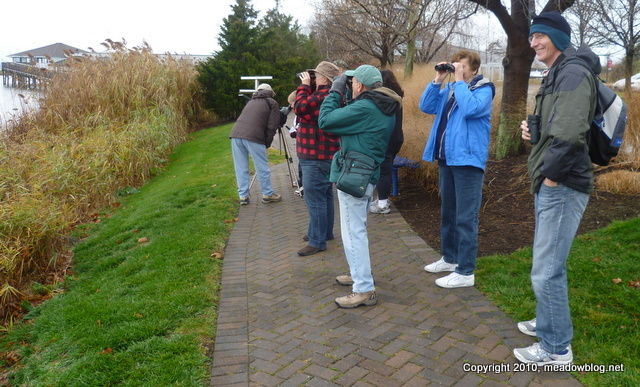 That strange thud you hear is the sound of people kicking themselves for missing the Meadowlands Commission's first annual "Green Friday" nature walk and talk. The rains never came, and some great birds were on the menu. Some 20 of us headed out to sample the ducks du jour (eight species in all), four species of raptor, plus Belted Kingfisher, Northern Flicker and assorted other avian delicacies. 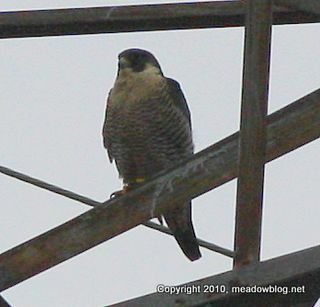 We twice had decent views of a Peregrine Falcon as it perched on a power-line tower. As promised, we are posting a distant fuzzy shot here. After the walk, we headed to the Visitor Center for a brown-bag lunch (the brown bags were delicious but a little on the tough side!) 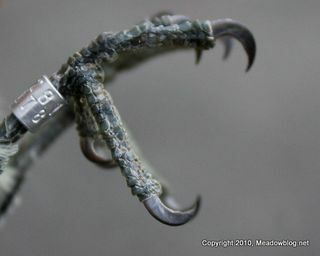 and a slide show on the amazing critters of the Meadowlands. A big thanks to all who attended, and another big thanks to Bergen County Audubon Society for hosting the walk with us. As we post this at 8:15 a.m. Friday, there is a spritz of rain or two, but also a lot of ducks in the Shorebird Pool at DeKorte (Northern Shoveler, Northern Pintail, Green-winged Teal, Gadwall, Black Duck and Mallard) and the wonderful sound of a Belted Kingfisher nearby. Bring your own lunch. There is a vending machine if you need a beverage. NJMC Staffer Jack Snipe brought in some left-over pies for a bit of dessert. 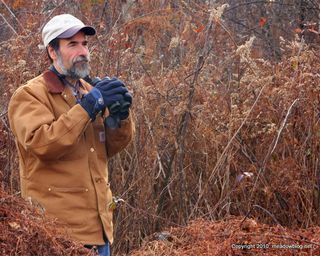 Don Torino, tireless nature-walk leader for Bergen County Audubon Society and all-around good guy, recently wrote a blog post on the Meadowlands for wildnewjersey.tv.